La destruction de la forêt a commencé. A big police force early this morning (July 26, 2011) moved away the activists. Later, the police demanded the activists to move their camp. They moved it a little bit to a private ground and stay close to the threatened area. First part is over. Now we are waiting for part 2. The struggle will continue. 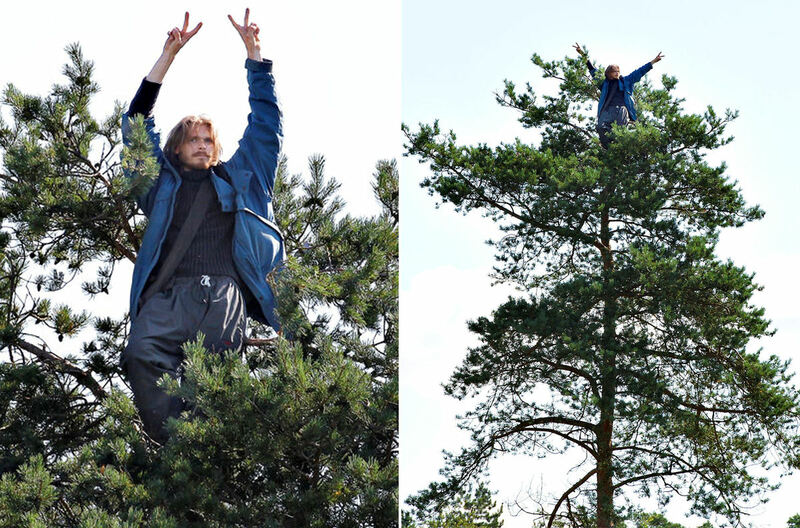 Thursday morning, the local Danish police gave up removing the activists who since Friday, 15 July 2011, have prevented the cutting down of forest to make room for the planned national test centre for 250 metres high windmills in Thy, Northern Jutland. 10 police officers turned up to end the blockade but withdrew when it turned out that there were more activists than exspected. They are camping in the forest area where the authorities intend to cut down the forest to create the right wind conditions in the test centre. We shall be back in great numbers, the police said. The test centre will be situated right between a protected birds area, a socalled Ramsa area, and a Natura 2000 area. The Danish Society for Nature Conservation finds that the law regarding the test centre violates the EU habitat directive and has brought the case before the EU Commission who has requested a detailed statement from the Danish government. Furthermore, a local association has filed a case against the Danish State. Friday, 15 July, the bird breeding season ended and by midnight the Danish authorities intended to start the cutting down. 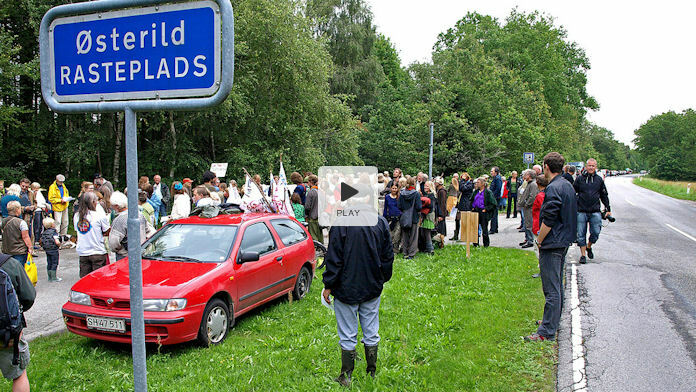 During the day, the local population protested against the demolition of Denmark's last wild nature. The activists simply laid down in front of the authorities' machines to prevent the cutting down to start. They are staying in the area in tents day and night. The ruling of the EU Commission is expected within a couple of weeks. The activists demand that the cutting down is postponed until the ruling of the EU Commission and the verdict of Danish court have been made public. The Danish press is following the case every hour. An open letter from a Danish association to the Minister for the Environment was published today requesting the Minister to stop the work. ”We find it very problematic that you, as the government's representative, wants to force through a very controversial test centre for windmills, as the most basic investigations of the negative impact on the surroundings have not yet been made”, the Association for Improved Environment writes to the minister. The demonstration in Thy has no central organization but arose spontaneously. A spokesman for the activists appeals for support and assistance from both Europe and the rest of the world. And, preferably, as soon as possible. Please contact Peter Skeel Hjorth, spokesman of EPAW in Scandinavia and the Baltic States. July 15th there was a big demonstration against the coming national testcenter in Thy in Northern Jutland. That day was the end of the time, when the birds breed in the protected habitat area near by. The breeding time for the birds ended at midnight. 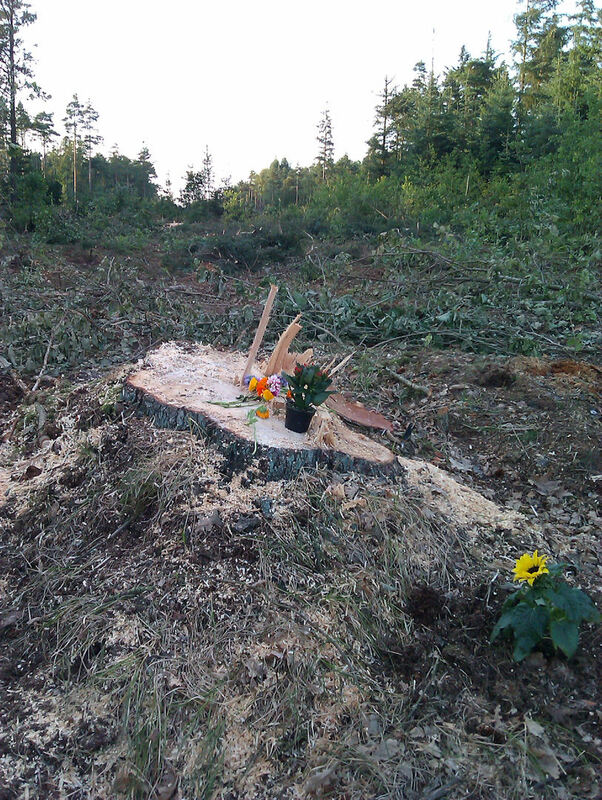 Exactly at that time workers should start to cut down forest around the testcenter area. Demonstrators blocked the machines and have stopped the work. The will stay until a decision has come from the EU Commission and the result from a Danish court. There are participants from other countries like Sweden, Norway and even Brasil.